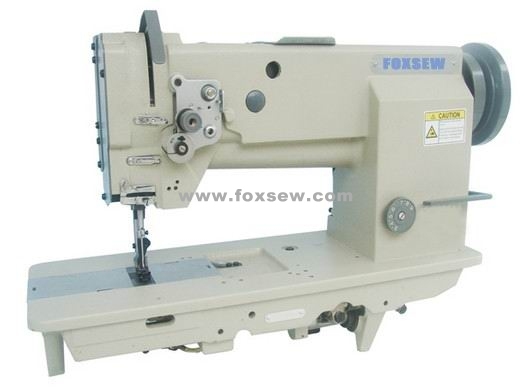 Features: This series is the latest of FOXSEW brand heavy duty compound feed lockstitch sewing machines, which is designed with large vertical rotating hook for thread loop catching and sliding bars for thread up-taking, It has been sub-classed into single needle, double need, with thick thread special rotary hook. FX-6400H, FX-8400H is improved on the basis of FX-6400, increase the needle gage to 13mm. The application of needle bearings for arm shaft and hook shaft, cog belt driving, plunger pump lubrication and compound feed by needle bar, presser foot and feed dog provides this series with such splendid features as smooth running, quiet working, and a long service life. 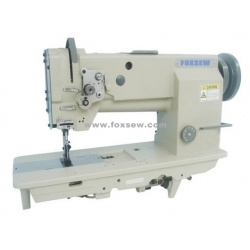 It is also equipped with a safety clutch to prevent the hooks from damage by over duty operation. So it is especially available in stitching sofa, car seat cushions, safety belts, safety air bags, car upholstery, bags, handbags, case, tents, parachutes, etc.